Lightweight Structures such as cablenets and tensioned fabric structures often exhibit relatively large deformations under changing loads. Rock climbers will rely on the extension characteristics of their ropes to cushion any fall to a deceleration that the body can withstand. 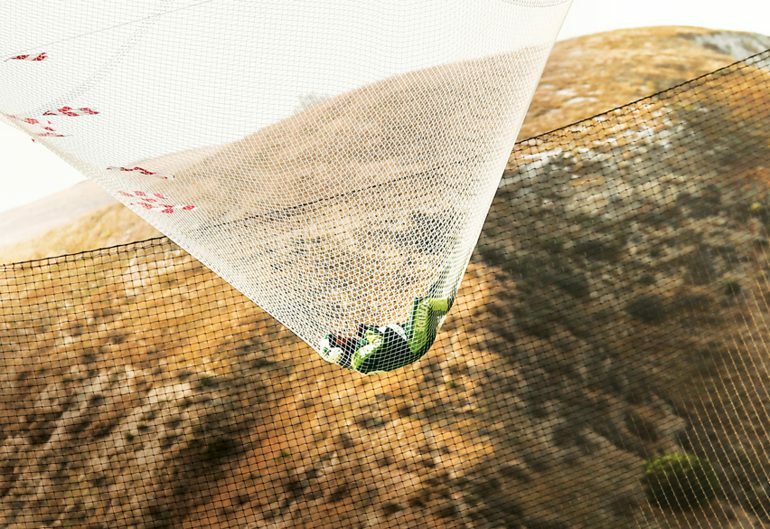 However the following link points to an extreme case of an engineered net to safely catch a dear-devil sky diver from a 7600m free fall without a parachute. A parachute is also an example of a tensioned fabric structure which adopts a geometric form in response to applied loads (person plus air resistance). See: https://www.createdigital.org.au/extreme-engineering-luke-aikins-skydive/ where the source of this image is acknowledged.